In the Middle East, people are used to good words not amounting to anything, so we have to be careful with our expectations. However, if there is one man who is going to change the relationship between the Muslim world and the US, everyone is now betting on Obama. I have been working on human rights and US foreign policy in the Middle East, Africa, and Asia, from one Bush to another Bush, Clinton and now Obama—four presidents in all during my adult life. Today, Barack Hussein Obama eclipsed all the presidents of the past. It starts with the way Obama walked and then jogged up the steps. The way he talked using straight eye contact with an ease that a nomad from Somalia could relate to, a gaze that would meet a farmer from Egypt with respect. His gestures and his body language were so dignified—the way he took off his shoes when he entered a mosque, the way he folded his hands listening to the woman who guided him, the ease in his way of listening. Obama was not just a foreigner, he blended in so well. I noticed his ease in talking to President Mubarak. Even with the translator on his left, Obama was looking at Mubarak on his right as if he understood every word, and with legs uncrossed. He gave a personal goodbye to Mubarak, and we could see a moment of genuine connection, the way he put a hand on Mubarak’s shoulder. Bush’s infamous line, ‘Either you are with us or against us,’ is gone. Obama’s message was clearly emphasizing our inter-dependency in fighting extremism. The Arab and Muslim world and the US have to work together in partnership as extremism takes a toll on us all. While it is obvious that Obama is extremely cultured and educated, when he speaks, he speaks from his heart and from direct knowledge. He’s also a man who has been exposed to extreme poverty as a child for a time in Indonesia. He knows what poverty is and he knows what hard work is. He knows that things can be better, and he makes us believe it. He is relatable and inspiring in a personal way, and he evokes something very special. Obama’s comments about Palestine and Israel gave us a ray of hope that the conflict can be solved. He understands the complexity and the complications of the issue. He reiterated that there has to be a Palestinian homeland and that Israel must stop the new settlements, but also that Israel is not going to go away. He was quite balanced on that. Perhaps most keenly felt was that he did not refer just to “Palestinians,” but he said the word “Palestine” which Americans tend to avoid actually saying. When Obama singled out women’s rights in the Muslim world, what he said was very good: ‘our job is not to tell you what women should wear or not wear, but denial of education for girls is unacceptable.’ An inclusive society is indeed one in which a woman’s right to choose is upheld, respected, and protected. It’s imperative to see women’s rights not as defined by the hijab, but by the right to freedom of choice—in religious practice, in forms of dress, in work, expression, civil status, and education. If a society has freedom of dress, freedom of religion, and freedom of political expression, women are more likely to live free from violence, political and otherwise. Obama spoke of how our common humanity advances only when all human beings can reach their potential. He emphasized that all mankind is created equal, so the health and economic development of all are extremely important. If he came here to urge women’s rights, then we in turn expect him to honor American women by making the US a proud signator of the United Nations’ CEDAW Convention Ending All Forms of Discrimination Against Women. As he said, we cannot be bound by our past, or we will never move forward. More than just his respect for equality, you could clearly see in his speech that this is a man who truly cares for women, who loves his mother and grandmother, his daughters and his wife. He’s approachable and you can see he has been surrounded by love. He makes these rights even more approachable, and we hope, inevitable. Obama spoke eloquently about the issue of democracy. He recognized that colonization and interference during the Cold War made these nations a proxy without regard for their own aspirations. He distinguished that while America’s war in Afghanistan was a war of necessity, Iraq was a war of choice. Obama owned that mistakes have happened but the US has no intention of maintaining an occupation. He is totally committed to American forces leaving Iraq and closing the prison at Guantanamo Bay. His message about democracy was very clear: ‘We are not going to impose peace. Indeed, no one can impose peace. But like peace, democracy is important— people need the right to express themselves, to speak their minds, to be confident in the administration of justice and transparency, to be served by a government that does not steal from your people. and to elect that government in a meaningful way.’ A government that practices this will be stable and successful. It was noteworthy for his emphasis on respect for minorities, the right to hold elections, to choose presidents, and freedom of religion. Rejection of someone else’s religion is unacceptable and brings about violence. 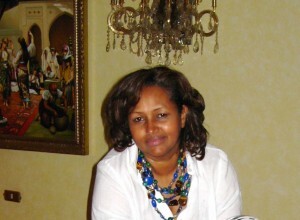 Hibaaq Osman is a humanitarian activist born in Somalia, founder and CEO of the Arab Women’s Fund and founder and Chair of the Karama (‘Dignity’) movement in the Middle East and North Africa, working to end violence against women in all public and private forms.